A lovely feminine wedding garter belt made with a narrow strip of french lace elastic, finished at the centre with a delicate piece of beaded gold lace. Soft and stretchy for a comfortable fit. Perfect to fit under a slim dress. Available in ivory/gold as shown. For the perfect fit, measure where you would like the garter to sit (usually about 3-4 inches above the knee) and choose the measurement (in inches) from the drop-down menu. Each order is made to your exact size. If you are unsure or buying for a gift, please provide the recipient’s approximate dress size in the comments on placing your order. If in doubt, go down a size as the garter can always be worn lower down on the leg if it is a little too snug. If you love your garter and can’t bear the thought of tossing it away at the end of the night to the crowd of gathered bachelors … just add a toss garter to your order! 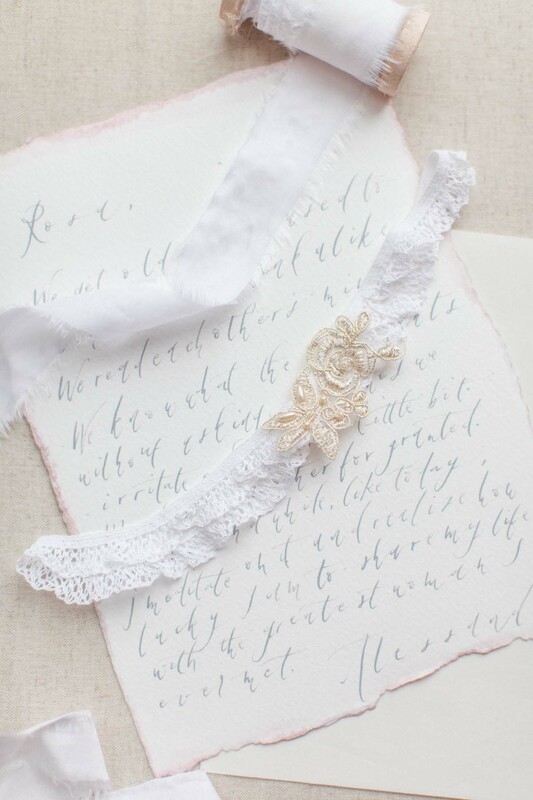 Your toss garter will be made to the same size and lace colour as your real garter on the day, simply without any further embellishment (so a simple garter of just lace). When the garter toss comes, just pop the toss garter on instead and fling away! 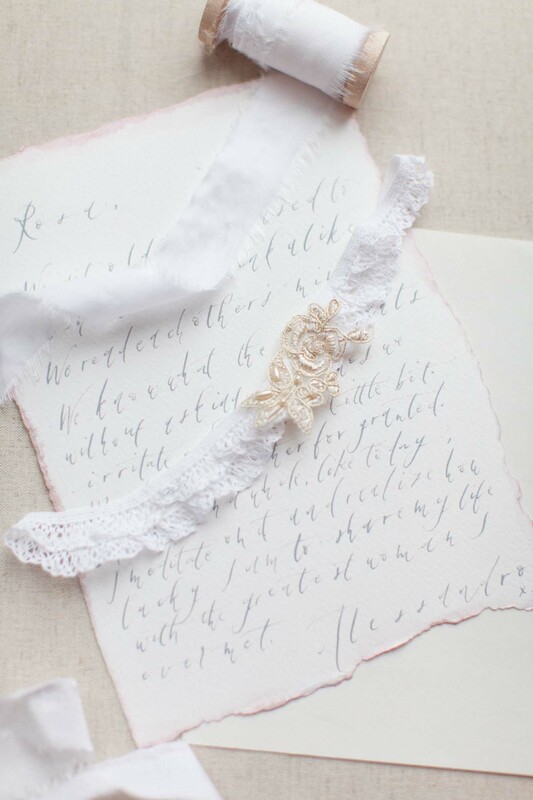 Then lovingly put away your real garter to keep in your bridal trousseau for years to come. Problem solved! A beautiful feminine wedding garter belt made with a narrow strip of french lace elastic adorned with two lovely tulle roses. Soft and stretchy for a comfortable fit. Available in ivory/pink as shown. Upgrade any of our garters with personalised sterling silver initial charms. Choose a single initial, the bride’s maiden initials or her married initials – or even both the bride and groom’s first initial! Price is for one charm and does not include the garter which must be purchased separately. A gorgeous, larger bridal garter in beautiful blush pink stretch lace adorned with ivory lace and a delicate trail of orchids in 14k rose gold plate. A beautiful piece of jewellery to wear under your dress on your wedding day. Soft and stretchy for a comfortable fit and with a flat profile to fit un-noticed under a slim dress. Available in blush pink/ivory (as shown).